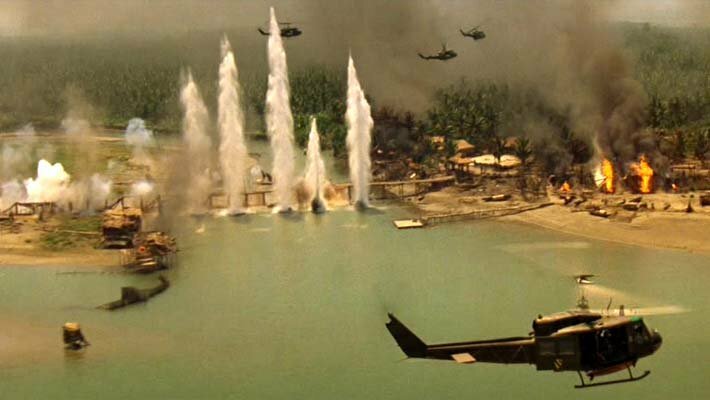 The aerial attack sequence, set to the tune of Richard Wagner’s “Ride of the Valkyries,” is one for which Apocalypse Now is justly famous. In a way it is the emotional high point of the movie; it is certainly the most adrenalized scene, the one time we get a glimpse into the other side of war — the exciting part — and start to understand what makes a gung-ho lunatic like Kilgore tick. Kilgore refers to the music as “Psy War Op,” or psychological warfare operations. I have written before about the military use of music, but in that case it was for torture; this is more a form of intimidation. “Ride of the Valkyries” is stirring, aggressive, and very Western; you can imagine how it might be a little scary in this context. And the fact that Wagner was Hitler’s favorite composer adds a whole other layer, a minor-key overtone. Then he calls in a napalm strike and, hey presto, it gets pretty quiet in the neighborhood. Cue the famous “I love the smell of napalm in the morning” speech. As he waxes lyrical, we realize that Kilgore has probably never been as happy in his life as he is in Vietnam, and probably never will again. This is his proper time and place, where he truly belongs. “Someday this war’s gonna end,” he concludes ruefully, drawing a look of priceless incredulity from Martin Sheen, and exits stage left. In the meantime, the boat has arrived, and that was why we were here in the first place, wasn’t it? It’s a little hard to remember now. In the Redux version of Apocalypse Now, this scene concludes with Willard and crew stealing Kilgore’s personal surfboard, much to the Colonel’s consternation. Of all the scenes restored to create Redux, this is one of the few that actually would have improved the original movie, IMHO. R. Lee Ermey, would would later play a Marine drill sergeant so memorably in Full Metal Jacket, appears very briefly as a helicopter pilot; keep your eyes open at 37:20 and 41:33. This entry was posted	on Friday, January 31st, 2014 at 1:20 pm	and is filed under Movie of the week. You can follow any responses to this entry through the RSS 2.0 feed. You can leave a response, or trackback from your own site. I like this part of the movie.